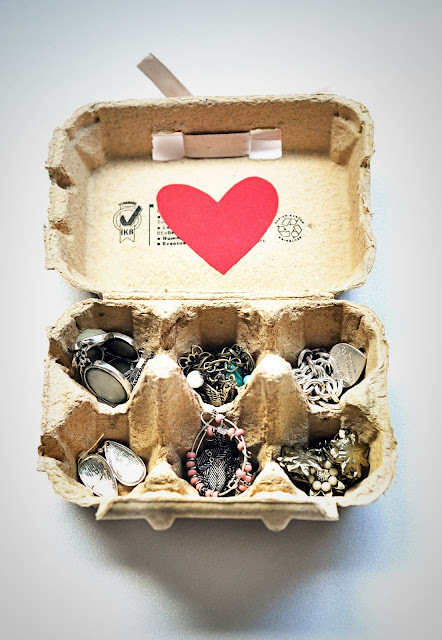 The idea for this DIY jewelry organizer came to me after seeing this image of egg carton doubling as a jewelry holder. If by chance there still is a person who doesn’t know that, I’d like to point out that I’m a big advocate for turning disposable into non-disposable. My previous projects include this metal choker (made out of thick paper), clear clutch (just a rolled thick plastic bag) and chain ring (a piece of a broken necklace worn as a ring), to name a few. Since I have a lot of stuff to do today, I won’t bother with the text too much and will jump straight to the point. The instructions for making this quirky interior detail are pretty basic but I’ll still list them. For this particular jewelry box, I used a big egg carton and white acrylic paint. Using a painting brush, I colored the box with acrylic paint. My color of choice was white, plus I had some left over paint so I thought to use that up. Of course, you can get a can of spray paint in whatever color you prefer or try decoupage, it’s entirely up to you. Also, if you want the color to be more prominent, you might have to coat the carton with two or three layers of paint. I love that rustic feel and the texture, so I left a few spots slightly uncolored. When done painting, place it in a well ventilated area to completely dry (leave it overnight for best results). And there you have it – cheap but most definitely chic and creative way of storing your jewelry! Looking for more interesting craft posts? Find them under the DIY tag! Also from now on, you can browse my gallery of quick snaps on Instagram! Click and follow me – @moiminnie! 59 THOUGHTS ON "DIY jewelry organizer"
this is surely an amazing idea! Sva sreca pa sam iz nekog razloga sakupila dosta tih kutija!!! This is such a cool idea! I love making disposable into reusable. This is such a great idea, I’ve seen it before but how nice to be reminded. I’m running out of space and before I run out and buy a new box I’m definitely trying this. Thanks! This is such a great DIY:) I’m going to have to try it sometime! Baš si mi dobru ideju dala! this is such lovely idea!! wow! U have a creative mind tt no one has. wow super cool idea! xO! Okay this is so cool I gotta try it! have to agree with u esp for someone who is expert at DIY :) perhaps for the lazy ones like me. A dress for 300over bucks is jus way too much with H&M label. u danasnje vreme je sve disposable, volim kada im ovako das novu vrednost! This could go in any drawer to organize bar pins and rings! oh thank you so much! soon i will shoot some pictures of them styled. i love this idea for jewellery, it is simple and great. your blog is wonderful! This is awesome, such a great idea!! great idea! what a blog!!! so happy to find it! I just found out your blog and I’m in love! pa ovo je – genijalno! I love this! So simple, yet amazing. I love turing disposable into nondisposable as well. I’ve actually been looking for something to organize my rings & necklaces in for quite a while now, I think I’ll be using your DIY. Thank you, and thank you for having such a beautiful blog and keeping me motivated to work on mine. tako dobro i jednostavno, svaka cast! This is so unique , just might haved to try this . Great idea! I’ll have to try this, and luckily I just finished up a dozen eggs so I have an empty egg carton! i never would have thought of an egg carton. i would imagine it’s perfect because it won’t scratch your jewelry either. oh wow. that’s amazing :) such a cute little project and it looks like it works very well. Very helpful idea might actually try it to decorate & organize.